WASHINGTON — A bus convoy carrying ISIS fighters and family members is still sitting in the Syrian desert with nowhere to go. The fighters are being evacuated from the Lebanon-Syria border as part of an agreement hatched with Hezbollah. The Lebanese military launched a military campaign nearly two weeks ago near its border with Syria to cleanse the region of ISIS militants. The operation resulted in a negotiated settlement to relocate the ISIS fighters near the ISIS strongholds of Abu Kamal and Deir el-Zour. The convoy consists of nearly 17 buses and several hundred ISIS fighters and family members. The coalition has been adamant that it and the Iraqi government oppose the deal and are not party to the agreement. Last week, coalition planes cratered a section of road toward Abu Kamal, causing the convoy to halt and turnaround. 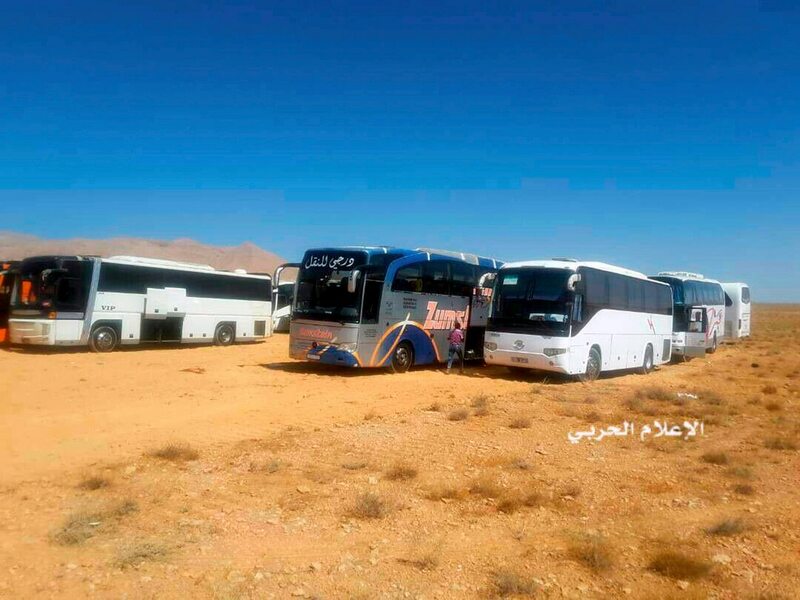 Since then, “one group of 11 buses remains in the open desert to the northwest of Abu Kamal, and the other group has headed west toward Palmyra, back into Syrian regime territory,” Col. Joseph Scrocca, a spokesperson for Operation Inherent Resolve told Military Times. The coalition is actively communicating with the Russians that the “coalition will not condone ISIS fighters moving further east to the Iraqi border,” Scrocca said. The coalition has offered suggestions to save the women and children, but would not elaborate further on what those suggestions were. Over the last week, coalition warplanes have slowly picked off ISIS fighters and vehicles attempting to approach the convoy. “The coalition has struck approximately 85 ISIS fighters and about 40 ISIS vehicles in the vicinity of the convoy, to include a tank, an artillery system, armed technical vehicles, and transport vehicles seeking to facilitate the movement of ISIS fighters to the border area of our Iraqi partners,” Scrocca said. Coalition warplanes have even targeted ISIS fighters straying away from the buses to relieve themselves. “Whether it’s to evade by foot or to relieve themselves, if they make it far enough out there for us to strike, then we will,” Dillon told Foreign Policy. The coalition has not struck the convoy itself, since the buses are carrying innocent women and children, according to Scrocca, and food and water have been provided to the convoy, he added. The coaltion says it “will continue to monitor the convoy, but not allow it to link up with ISIS in the Euphrates River Valley. ISIS is a global threat; relocating terrorists from one place to another for someone else to deal with is not a lasting solution,” Scrocca said.